I really liked that rounded vase for the flowers and thought it would be nice to have a die that could make it for me. But since I don't own anything like that, I decided to just make it myself using the partial die cutting technique and a craft knife! Would you like to take a look at the process? You can watch the video below or at my Youtube channel! Me gustó muchísimo el florero redondo de la foto de inspiración y pensé que sería genial tener un troquel que pudiera hacer esa forma. Pero como no tengo nada parecido... ¡decidí hacerlo yo misma utilizando la técnica del troquelado parcial (¿se dice así? :)) y un cúter! ¿Queréis ver el proceso de creación? Pues solo tenéis que darle al play aquí abajo o en mi canal de Youtube. Hi Amanda, What a beautiful card, your friend will be very honoured to receive this card! This is a beautiful card! Which that I could get something like this too!! This card is beautiful. I love it! Me gusta mucho! La tarjeta es una maravilla, me ha encantado y el video muy bueno. Gracias por compartir. Te sigo. 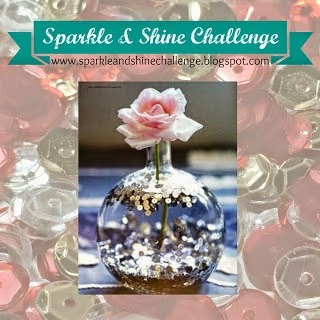 the Sparkle and Shine Challenge! I'll be very surprised if you are not chosen as a winner! Oh my word! This is STUNNING! Perfect take on the inspiration photo! Thanks so much for joining us at Sparkle and Shine!!! What a gorgeous card; I just Pinned it on 3 boards - Wedding, Winnie & Walter, and Shakers! Saw your card video on You Tube. Your card is gorgeous. Love the technique. Thanks for sharing. Absolutely beeeeautiful card!! And just in time since I have to send one this week. I had something else in mind, but yours blew me over. On another subject, what mat are you working on? It looks fabulous!